The Next Stage: Women and Retirement: The really good news from the Women’s March--the emphasis on voting! The really good news from the Women’s March--the emphasis on voting! 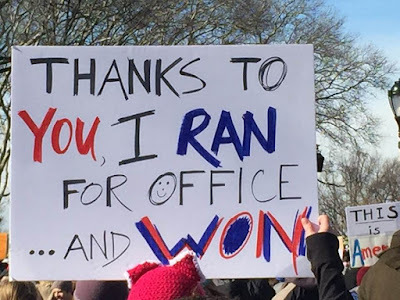 I managed to attend part of Saturday's Women’s March and was encouraged by the large turn out. The March was diverse in age with many young women, including many who looked like they were high school age. In terms of race/ethnicity, the March was once again a disappointment. Given the demographics of Philly, the crowd should have been much more diverse. I know the organizers worked hard to attract a multi-racial crowd but the fact that 53% of white women voted for Trump no doubt had some thing to do with the low numbers of women of color. We have work to do. The president of Planned Parenthood called on white women to do more to "save this country from itself," acknowledging that women of color were responsible for with many of the recent political victories. The really good news from the March was the emphasis on voting and on the critical need for more feminist women to run for office. Many of the signs conveyed the message that women must use the power of the ballot to get rid of Donald Trump. Marches can energize and galvanize but the only way to rid our county of this monster is to elect a Democratic House and Senate who will impeach him or, failing that, defeat him in the 2020 presidential election. It will be a different electorate in 2020. Many of those young women at the March were too young to vote in 2016, but they will be out in force in 2018 and in 2020. I was especially heartened by the Las Vegas rally, which launched an effort to register 1 million voters and target swing states like Nevada in the 2018 midterm elections. Change is coming. I watched and cheered and sang with the marchers. Yes, it is important to do better to be fully representative of our communities. Some places did better than others.Now is the time to lay out plans for face to face talk with African American women and men. This election cycle beginning in the spring must be our mutual focus.